All indications suggest TSV have achieved their long-term goal of fleeing Allianz Arena. The team is most likely to play the 2017/18 season at centrally-located Grünwalder Stadion but the circumstances are nothing like the Sechziger supporters would wish. Instead of leaving for a brand new private stadium, as promised by the Jordanian investor, TSV are suffering from relegation to the 4th tier, the Bavarian Regionalliga. This being their lowest position in many decades, it makes no sense to use the 75,000-capacity Allianz Arena. But while Bayern president Uli Hoeness announced he would not hold TSV hostage at the stadium, both teams are still bound with contract that forces TSV to remain at Allianz Arena until 2025, paying an annual fee of €3.5 million. In mid-June Bayern confirmed there are talks of terminating the deal, but as of now it's still in force. As we've already informed you, the German champions are spending roughly €10 million on upgrades which include two giant screens, each with 200 m2. 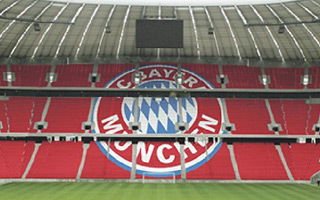 Bayern continues to claim they are Europe's largest, though it's obviously untrue. Regardless, just yesterday one of the screens was lifted into position, becoming far more imposing than the previous one. Die erste Videowall wurde heute in der Allianz Arena montiert. Hier knnt ihr nachverfolgen, wie sich 200 Quadratmeter bzw. 20 Tonnen an die Stadiondecke bewegen. The team also invested in new lighting which now offers luminosity of 2,200 lux instead of previous 1,500 lux. More importantly, the use of LED lighting offers significant savings in consumption and gives increased opportunities to create atmosphere with alternating colors. On Monday the team had signed a deal with Siemens as their new premium technology partner. Now Siemens is expected to deliver the newest solutions in terms of stadium management, safety and spectator experience. Forget the new parking site for away fans, new signage and reorganisation of stadium access routes. One more expansion is in the making, even if again it's more modest than you might think. From over 66,000 the stadium has already grown to 75,000 capacity, but only including terracing. As an all-seater the ground is still within the 70,000 range. For the 2018/19 75,000 should be the all-seating capacity, according to Augsburger Allgemeine. It's also a long-standing dream of many supporters that all seats are replaced with new ones, to finally honour the club's colours (one possible layout displayed above). However, despite speculation from several news outlets, this hasn't been confirmed.